I’ll be hosting a shower for a friend’s vegan daughter this spring. I think I’ll add this recipe to the menu! It does contain cheese and egg, so it’s not vegan. But it is vegetarian, and the bride-to-be has been known to splurge on a few non-vegan items. So hopefully she’ll think this recipe’s worth checking out! This dish is a great change of pace, vegetarian or not. (My husband thinks I need to make it more often.) Serves 6. Mix the above and bake in 8” x 5″ buttered loaf pan at 350 degrees for 45 minutes. Cool 10 minutes. Unmold. Serve warm. Or refrigerate. 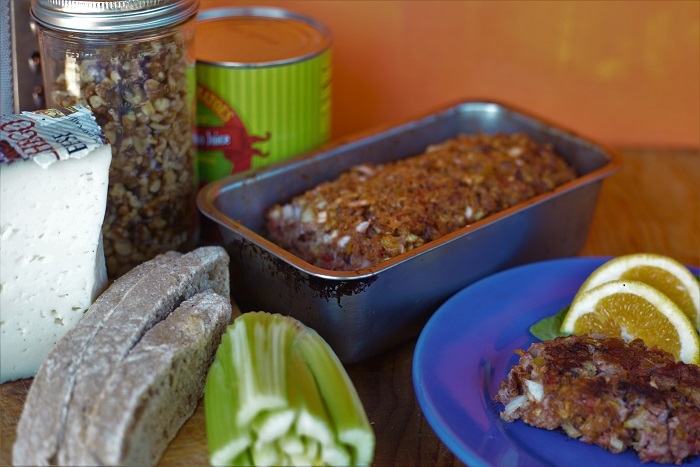 Slices of the nut loaf can be seared in a dash of olive oil or butter; a great way to serve leftovers.